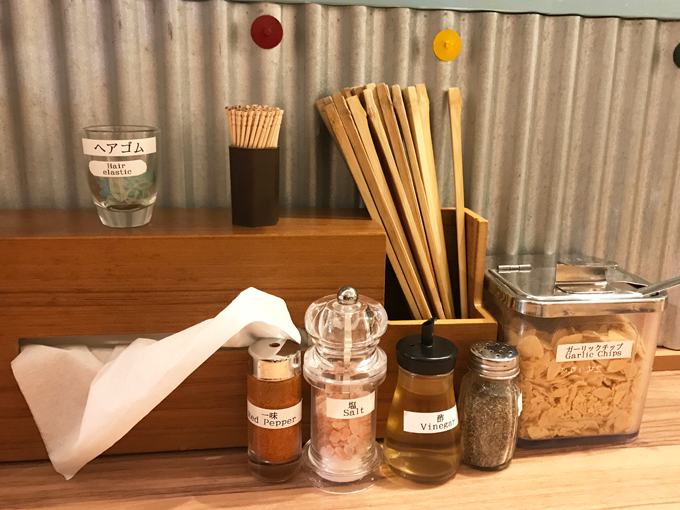 Soranoiro is a ramen shop with one vegan ramen on their regular menu. They also have seasonal vegan ramen from time to time, but I didn’t see any when I went there. The vegan ramen they have is called “veggie ramen”. You can make it vegan and gluten-free by ordering the “veggie ramen with brown rice noodles”. One other item they have that’s vegan is the soy milk soft serve. You have to purchase your order ticket with this machine before you get seated in the restaurant. They cater to their female customers too, so they even have some hair ties in a shot glass, and you also get asked if you’d like a paper bib so you don’t get the soup splashed onto your clothes. How thoughtful! I love all the condiments they have as well. From the left, cayenne pepper, salt, vinegar, black pepper, and garlic chips. I ordered the veggie ramen with brown rice noodles. The broth is made with veggies with lots of carrots with a small amount of salt, to enhance the flavor of the vegetables. It usually comes topped with 4-5 seasonal veggies, in this case, carrots, red bell pepper, sweet potatoes, cabbage, and broccoli. It has a light drizzle of soy milk and a small amount of yuzu pepper paste on the side so you can enjoy different flavors. I enjoyed the mild carroty veggie broth. But since I love anything with garlic and chilis, I added the garlic chips and cayenne pepper, and it made it like a garlic aglio e olio ramen, which was awesome! Brown rice noodles were perfectly cooked and went very nice with the ramen. 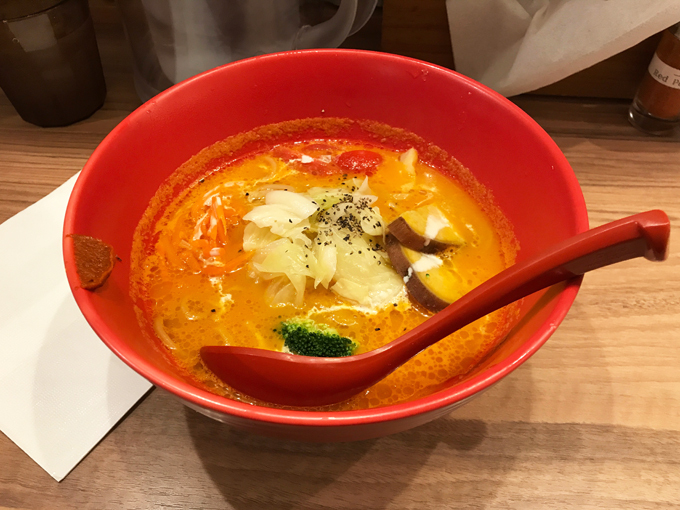 If you just get the veggie ramen with the regular noodle without the substitution, they use ramen noodles that have red bell pepper kneaded in, so it must be pretty against the orange carroty soup. 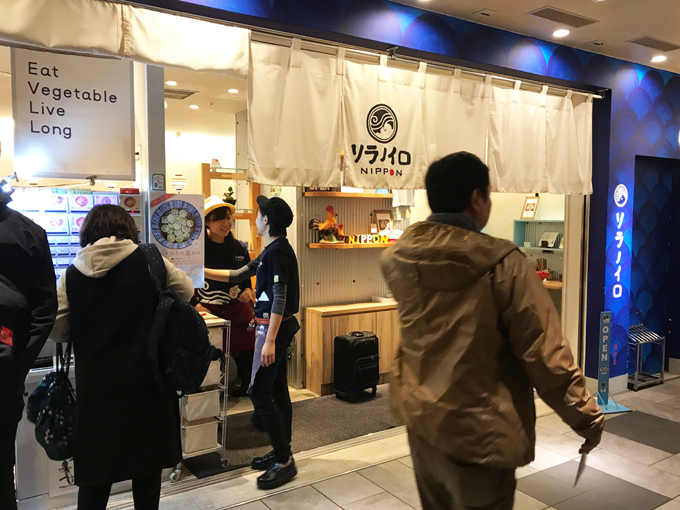 Soranoiro has the following 3 locations in Tokyo, so check them out if you are ever in the area.